I feel like this will be the on the go version. It has been busy around here! I am finding joy even in this season of busy. We gathered with 7 of the 11 families from our adoption group. There were a total of 33 families that traveled with us and then we ended up splitting up and each group went to their region. Hard to believe it has been 10 years! We (and when I say we I mean Chuck!) helped my parents dig a french drain. I did some baking for a school fundraiser. Megan had her spring concert this week. I may have teared up toward the end knowing this would be the last program for her. There was a nice afternoon rain. I never tire of sitting on the back porch smelling fresh rain. My dad has a tradition of sitting on the front porch with a pocket knife and an apple. The kids, big and small, love when he does this. I don't think the squirrel minds when he does this either. 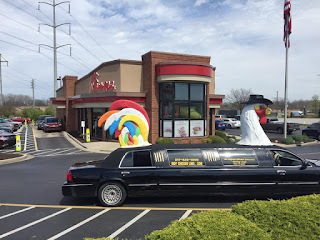 As part of a fundraiser Megan was able to ride in the Chicken Limo to have lunch at Chick-fil-A. They are treated like royalty when they do this. Chuck has to work on Saturday. :) Megan and I plan to spend the day working on her science fair poster and I hope to get some organizing done. Have a great weekend! 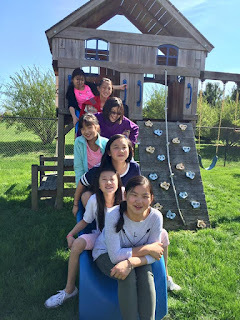 We have been experiencing some nice weather. I don't know about you but that calls me to be outside. This planter is in our backyard. Not far from the back porch. As you can tell it had seen better days! It should have been take care of a long time ago but never made it to the top of list. It was one of those things that when there was room in the budget there wasn't time and when there was time there wasn't room in the budget. We knew that this would be a top project this year and had put monies aside for it. Landscape timbers were on sale and that pushed this to the top of the list. Chuck spent an evening pulling out the old timbers. Once the rebuilding started it was a family affair! There were a couple of stubborn nails that would not go in and keep bending. Megan cut them flush and no one will ever know we had an issue. Awww... so much better! When there are several dry days in the forecast I will stain it the same color as our fence and in about a month we will be past the frost day and I will plant. I can't wait to see this area in bloom! This metal stake was also in that flower bed. The sun had really faded the colors so I gave it a make over. Some leftover spray paint, a little craft paint and it is good as new with no money spent. Megan keeps telling me how much she likes it and what a good job I did. That makes my heart happy! When I get the finishing touches on this little area I will be sure to share a picture with you. In the mean time I need to hustle this morning. My dishwasher broke and I have a stack of dishes on the counter waiting to be dried and put away. What projects have you tackled in the last week? Tune in next Tuesday to see what homemaking debt I tackle. We have had a jammed packed weekend, as I am sure many of you have enjoyed. Friday evening we dyed eggs. 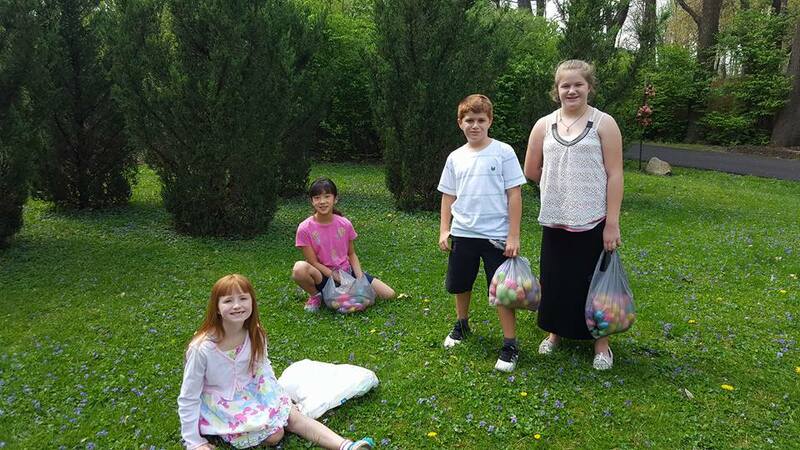 Then Saturday and Sunday we celebrated Easter with family gatherings. First with Chuck's dad and them with my side of the family Sunday afternoon. I hope you enjoyed snapshots from our Easter celebration. Quite frankly I am short on words this evening. Not only was the weekend busy, but I find Easter to be full of emotions. The eggs are empty and so is the tomb. Jesus is our living Savior! It seems Spring has arrived. The early flowers are in bloom and the trees are budding out. Seeing new life pop up every where makes this my favorite season for a variety of reasons. I finally got all of the warm weather clothes washed, ironed and put away. It seems that one day we are close to 70* and then it is close to freezing. Typical for around here. That makes it good to be prepared. They say April showers bring May flowers. We have had our share of showers and a thunderstorm or two thrown in. It's one of my simple pleasures to sit on the back porch and listen to the rain hit the metal roof and smell the freshness. It makes my heart happy! The grocery shopping for the month was finished up this week. Lots of freshness in these jars. It significantly cut down on waste and trips to the grocery keeping it this way. Not only that, but it looks pretty too! Freshly painted nails for a busy weekend. I use to keep them painted all the time. Not so much anymore as housework is hard on them. 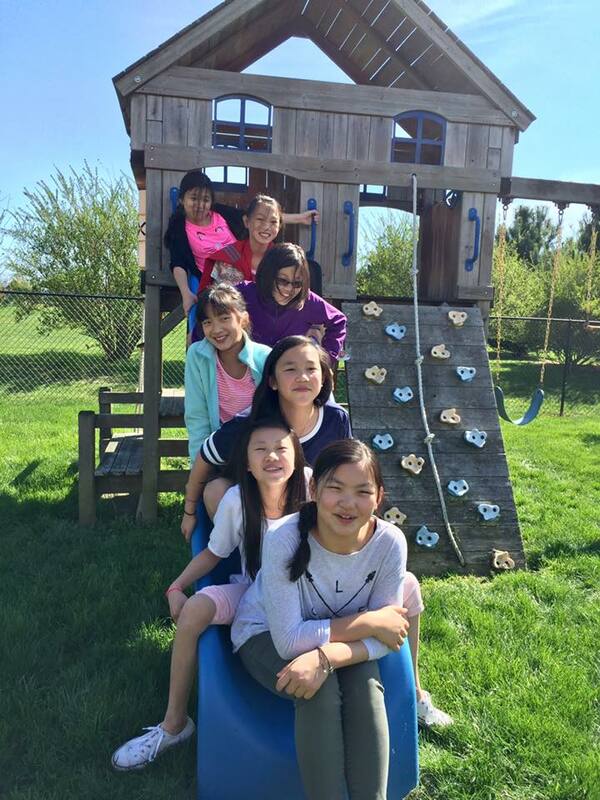 Warm, sunny days means it is time for projects! I need to run this morning. I have a list of things to accomplish today. We'll be busy this weekend. Tonight we will help my in-laws get a new water heater. Saturday we have a gathering with friends, and Sunday we are trying a new church. In between all of that I hope to work on our current project. We'll see. Have a great weekend!